It will be out 11-26 from Lolipop Records! Closing out the summer in fine form as part of a line up of top notch modern surf acts. 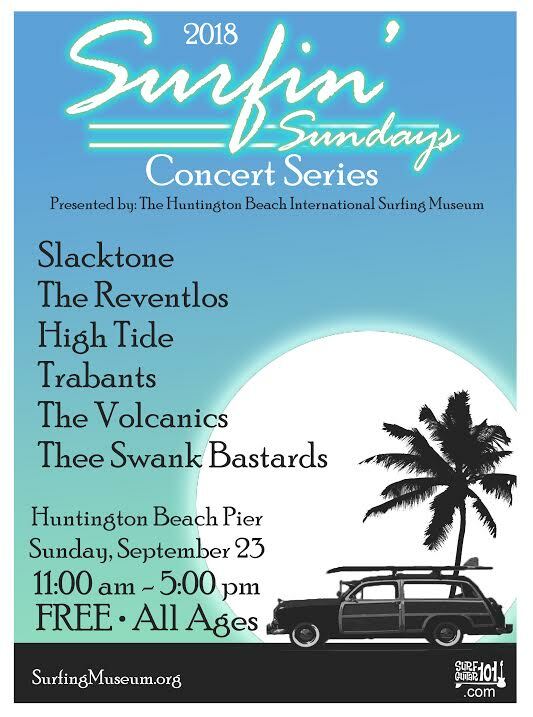 Come join us for a free afternoon show at the Huntington Beach Pier! We're stoked to play a show with Boston surf legends THE FATHOMS on August 4th as part of easy ed's record hop which is always a good time. Playng a one-off east coast show this thanksgiving eve in Portsmouth, NH with the amazing Prom Queen from Seattle. 8 PM and all ages! We took a tiny vacation from playing instrumental surf tunes to collaborate with our friend Samira Winter on a catchy indie-pop tune called "Just Stay." We're excited to be a part of Echo Park Rising once again this year! We'll be at the Short Stop as part of the Lolipop Record showcase on August 18! We're helping our good buddies So Many Wizards release their new LP Heavy Vision June 8th at the Hi-hat in Los Angeles alongside Susan and Roses. This will be one for the books! BOSTON PEOPLE: West Coast Psych takeover of the East MAY 14 at Great Scott as we Join our Los Angeles co-horts Mystic Braves and the Creation Factory for one night of their world tour. We're thrilled to share the stage with Guantanamo Baywatch and our friends Frankie & The Witch Fingers Monday March 13 at Resident! Tix available now! We're thrilled to be playing Lolipop Record's Echo Park Rising Showcase at Lot 1 Saturday, August 20th. C U there! We had a blast at the Blindspot Project! One more show in April with the Hurricanes at Harvard and Stone April 14th alongside DJs Brian Waters and Adam Mayes. As if that wasn't enough, it's FREE!!!! We'll be playing the Blindspot Project once again on Aprl 2nd with Levitation Room and more. There are also some east coast shows in the works for the spring. We couldn't be more excited to announce this show of EPIC proportions. December 12th in Downtown LA, join us for this all-night psychedelic ball featuring us, The Creation Factory, a stellar lineup of DJs and vendors at the Blindspot Project. This one is truly not to be missed! Thanks to everyone who made it to any of the west coast tour shows! We hope to see you all again soon! We put some photos up in the shows section. After a couple of months intensely making a new album, it sure is nice to get out and play. Happy to have Triptides and Seaweed Salad aboard on Friday February 27 at the Ham and Eggs Tavern in Downtown LA. Things have been quiet here on the website but it's because We're hard at work on a new full length album which is now being mixed. More news on this soon... Very exciting stuff! We're also excited to be a part of the movie Surf Noir which features a collaboration with the actress Troian Bellisario singing on our version of Sea of Love along with an original score performed by Trabants. Lots of recording going on this month but we're taking a break from that to host our good friend and occasional musical collaborator Prom Queen who's releasing a DVD album this month. We took the opportunity and booked a show with some of our favorite area bands who are deserving of your attention. See you at Ham and Eggs Tavern October 16! We're coming off of a brief hiatus and kicking off a busy fall with this stellar show at the Smell in downtown LA with Yonatan Gat who was once the guitar player in Monotonix, a band I truly loved from Tel Aviv. His new project is no less awe-inspiring. Also, Traps PS rock it. We had an amazing tour on the east coast! Thanks to everyone who made it out to a show or helped us along the way! Now, we're very excited to play Dreamland #9 with the Memories, The Zermatts and Wax Children. Psyched to be on this bill! We're thrilled to be hitting the road next week through out the East Coast on our way down to play the Instro Summit Festival in Durham, NC. We haven't made it to some of these places in a good while so we hope to see some of you out and about! Our friends at Lo-Pie have added us to an AMAZING show on May 1st with Charlie Megira who is traveling all the way from Tel-Aviv to bring some garage surf jams to Austin Psych Fest via California. This is a show you won't want to miss. The Falls in Downtown LA just got its entertainment license and Trabants are going to curate a monthly night. We plan to host live music in the future, but to kick things off, come out this wednesday to hear some crazy garage pop and surf from around the world. see you there! Welcome to the new Trabants website. We're working on lots of new music and heading out on an east coast tour in May which includes a stop at the Instro Summit festival in Durham, NC. Hopefully we'll see some of you out on the road. In the Meantime, come out to Lolipop Records in Echo Park this Tuesday for a free show with the Electric Magpie!